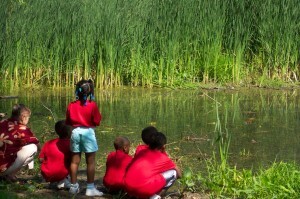 Explore a wetlands habitat, and enjoy its fascinating ecosystem at Awbury. Or maybe you just need a place to reflect waterside. On any given day you may see or hear frogs, turtles, dragonflies, or visiting ducks. There is always something new and interesting to keep you learning. Historically, the wetlands area was Wingohocking Creek, but the current form reflects the plan of Arthur Cowell, landscape architect responsible for the property during the City Parks Era, i.e. a bog and two ponds connected by a small intermittent stream. In wet periods, the overflow travels underground to Frankford Creek and the Delaware River. Stone walls and bridges are modeled on those around Avebury, the Copes’ Wiltshire home village. This section of the Awbury property reflects one of the few major changes made by the City Parks Association.